Our company is a company based in Kiev, Ukraine working to provide short-term and long-term accommodation in apartments and B&B as alternative to Kiev hotels. 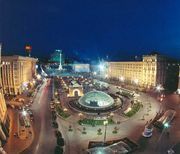 We offer Kiev apartment rentals ranging form €10 to €120 per night. All apartments can be booked via internet or by telephone. Reservation is free of charge and available 24 hours per day. Please, make your booking in advance, the preferable term is 2-3 weeks before your coming to Kiev. If you want to reserve certain apartment with fixed address we may ask you about pre-peyment for 1 day (by Bank transfer, Credit Card reservation, Western Union etc). Pre-payment is refundable. Definitely, pre-payment is not a rule and we often book apartments without it. While booking, please provide us with your correct contact information, name, telephone and e-mail. Also we require confirmation 2-3 days before you arrival to Kiev. Check-in time is at 13.00 or later. The apartment keys are to be collected at the transfer or in the management office, which is open 24 hours. Departure time is before 12.00am. Our manager is coming at your check-out time to pick up keys. For another requested check-in/out time let us know in advance. Each apartment is supplied with high-speed internet access modem with Wi-Fi modem. Internet access is unlimited and free of charge for all our clients. Our driver can meet you at the airport or train station. Transfer Boryspil–Kiev costs transfer from/to train station . We will need your flight/train details then. This price does not depend on flight delays and the day or night hour. Driver service is available 24 hours during the day.